Why should I take a health kit when travelling? A basic travel health kit is important no matter where you travel. First aid supplies and medications may not always be readily available in other countries or may be different from those available in Canada. A good travel health kit contains enough supplies to prevent illness, handle minor injuries and illnesses, and manage pre-existing medical conditions for longer than the duration of your trip. What should I pack in my travel health kit? It is essential to know how and when to use the first aid supplies in your kit. You may consider taking a first aid course before you travel. Tweezers for removing ticks, splinters etc. Discuss the use of medications with your health care provider before departure and carefully follow the directions for use, including dosage and when to seek medical care. Bring more than enough medication to last your entire trip. Consult our Travelling with medications and What you can bring on a plane pages for more information. Antifungal and antibacterial ointments or creams to apply to wounds to prevent infection. If you need to use needles or syringes, take more than enough to last for your entire trip and carry a medical certificate from your health care provider explaining that the needles or syringes are for medical use. 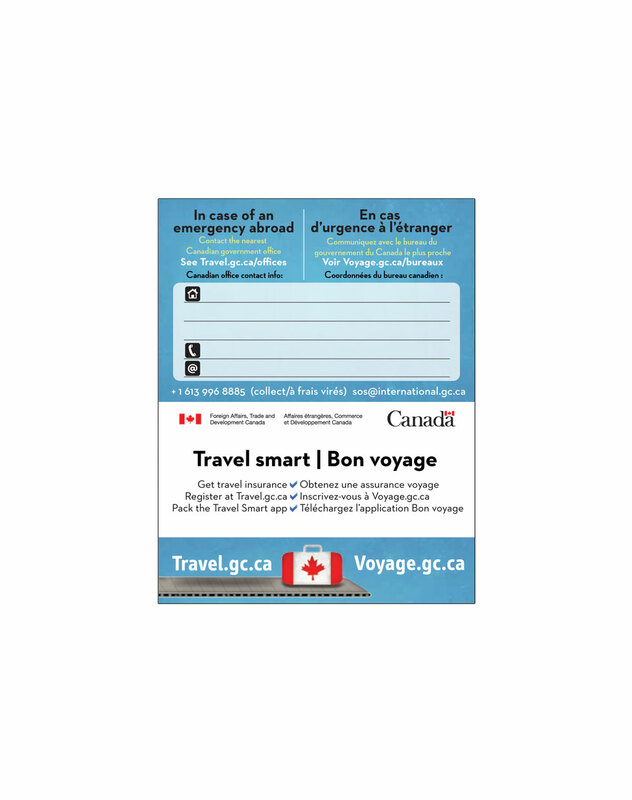 Before you go, don’t forget to register with the Registration of Canadians Abroad service and stay connected to Canada in case of an emergency abroad or at home. Always carry proof of your health insurance coverage when travelling. Consult our page on travel insurance for more information. Carry a copy of your immunization record in your travel health kit. Include your original International Certificate of Vaccination or Prophylaxis for yellow fever, if you have one. For a printer-friendly travel health kit checklist, click here.